Sets coordinates of suspension axis, along which a wheel moves vertically. Sets a wheel spindle axis in coordinates of the frame (body 0): an axis around which a wheel rotates when moving forward (or backward). Returns the wheel spindle axis in coordinates of the frame (body 0). 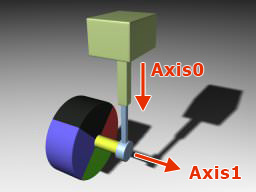 Sets a wheel spindle axis in coordinates of the wheel (body 1): an axis around which a wheel rotates when steering. Returns the wheel spindle in coordinates of the wheel (body 1). Sets a coefficient specifying how fast the optimal lateral force can be achieved. Returns the coefficient specifying how fast the optimal lateral force can be achieved. Sets the rotation velocity for the attached wheels. Sets a coefficient specifying how fast the optimal longitudinal force can be achieved. Returns the coefficient specifying how fast the optimal longitudinal force can be achieved. Sets a threshold difference between the wheel and ground velocities. Returns the threshold difference between the wheel and ground velocities. const Math::vec3 & axis10 - Wheel spindle axis in coordinates of the frame (body 0). Wheel spindle axis in coordinates of the frame (body 0). const Math::vec3 & axis11 - Wheel spindle axis in coordinates of the wheel (body 1). Wheel spindle axis in coordinates of the wheel (body 1).